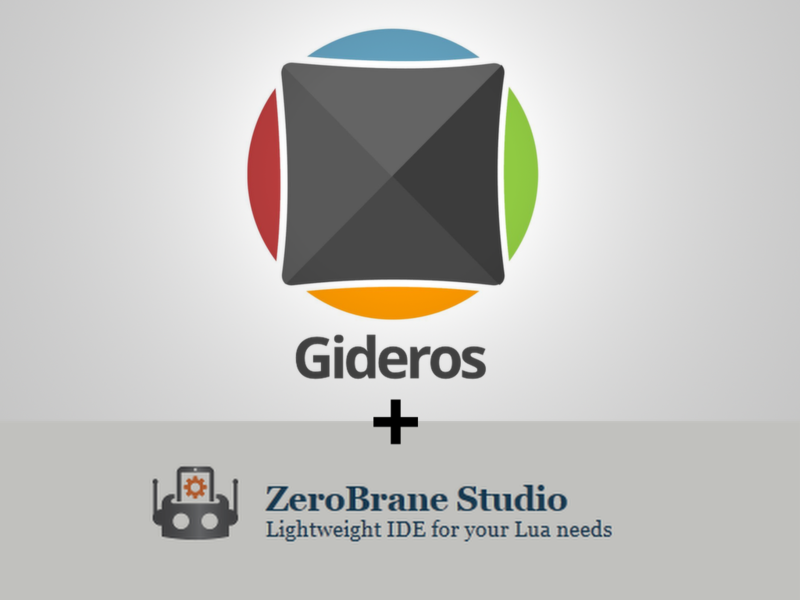 I made this tutorial to help you get started programming Gideros in ZeroBrane Studio. If you did not try it yet, now it's the best time. The tutorial explains how to configure one-click on-device testing for multiple devices and other tricks. @keszegh, thank you for the detailed tutorial! I'll add a link to the threads that discuss on-device debugging with Gideros and ZBS. nice one, I will read it later in detail, but I think this one is quite well detailed. @ar2rsawseen, actually i'm surprised that not everybody uses zbs, are there any other good alternatives? with the gideros ide i was already a bit frustrated when zbs came around. perhaps you can make a poll about which ide people are using? it would be interesting to know the options. I cannot speak for everyone, but when I write I prefer using TextMate as I have been using it for a very long time now, I tried Sublime, but then when I have a licence to Textmate and used to it, why move. For Gideros code, it is a pain to write code outside and then reload the file in the IDE, so I use the IDE itself, one because it offers autocomplete (which is painful on a Mac as the tooltip hijacks and I cannot use the Esc to auto complete and Alfred uses ⌥+space and Spotlight uses ⌘+space. So it does get frustrating. There was a brilliant article about live-coding but when you cannot replicate what you see, you lose interest and do not want to waste time. So I gave up on using live-coding as per that article/post. I dabbled with ZBS on and off but it was just about starting one more applications/editor that prevented me from using it on a regular basis like the IDE or Textmate. and like a tweet I had seen a couple of days ago, "I used Vim for two years because I could not get out of it"
i agree that setting up zbs was a thing i gave up several times. yet i always tried it again when i could not bear with gideros ide. and when i managed to set it up, i almost never have to leave it, just once in a month when i publish my apps. with this tutorial perhaps this entrance-fee to set up zbs is lowered to an hour from a few days. Program starting as '"C:\Program Files (x86)\Gideros\GiderosPlayer.exe"'. Program 'GiderosPlayer.exe' started in 'C:\Program Files (x86)\Gideros\Examples\Graphics\Bird Animation' (pid: 6580). Starting the player and waiting for the bridge to connect at 'C:\Program Files (x86)\Gideros\Tools\gdrbridge.exe'. Couldn't connect to the player. Try again or check starting the player and the bridge manually. Program completed in 6.10 seconds (pid: 6580). I tried starting the player manually which just gave me one open player on screen before clicking run and then a second player appeared for a short while before closing as before. Any ideas about how to get it playing? @petec, first, you do not need to start the gideros player manually. So i tried with the same example project and for me it works. First it gave me the same error as for you, then i pressed the play button again and it worked. I guess waiting for the player times out too early. So you should try the same. Also, did you add socket.lua too? I was never sure when it is needed, but it's better to be added in any case. did you put at mobdebug your computer's ip address? i will try to help as much as i can, especially that i want that the tutorial is correct. also perhaps @paulclinger can help. Program 'GiderosPlayer.exe' started in 'C:\Program Files (x86)\Gideros\Examples\Graphics\Bird Animation' (pid: 6440). Starting project file 'C:\Program Files (x86)\Gideros\Examples\Graphics\Bird Animation\Bird Animation.gproj'. Debugging session started in 'C:\Program Files (x86)\Gideros\Examples\Graphics\Bird Animation\'. "Qt: Untested Windows version 6.2 detected!" @keszegh Thanks for the suggestions. I had tried running several times as your tutorial usefully mentioned that I might need to but it failed each time. Just tried again and it is starting up ok usually on the second attempt. No idea why it's doing it now when it wouldn't before as I've changed nothing, but I'm happy that I can now play! i'm glad, and yes, usually the second attempt. perhaps @paulclinger can look into it so that it works for the first time. I'm not sure why it's sometimes working and sometimes not, but given the discussion in the thread, it doesn't seem like something I can fix in ZBS. The reason why the player may not connect to ZBS on the first attempt is that ZBS waits for 5 seconds to get a response back from gdrbridge after it's started. If it doesn't get a response in that timeframe, it shows the error message that @petec referenced. It usually works the second time because the process works faster. I can increase the timeframe, but users will then wait longer if something is really not working. is it possible to set the timeframe in some config file perhaps? Does Zerobrane a listbox with all the function names to navigate your source box or just that dropdown menu? @GregBUG, there was indeed an issue because of using of flat namespaces and OSX 10.9.1+, which was fixed in the current version of ZBS (https://github.com/pkulchenko/ZeroBraneStudio/issues/264). Please try the current code from github (https://github.com/pkulchenko/ZeroBraneStudio/archive/master.zip); this should also be included in the coming v0.41. one thing: it's possible (in a next version) to have functions navigation using a "treeview" or a "listbox" ? @GregBUG, not in the next version as it's almost done, but I do plan changes for function navigation in the future. more than 1024 views of the tutorial so far..
> it's possible (in a next version) to have functions navigation using a "treeview" or a "listbox" ? @GregBUG, this function navigation (using a treeview) has been implemented. The most recent version (0.95) also adds fuzzy search for files, symbols/functions, and library API functions. ZBS is a great IDE. I use it exclusively now. Although there is a tutorial tag in the forum, it would be great to collect links to tutorials somewhere on the gideros website where beginners can easily find them. My two tutorials have surprisingly many views, but making them and other tutorials more visible would be great to attract newcomers to gideros.